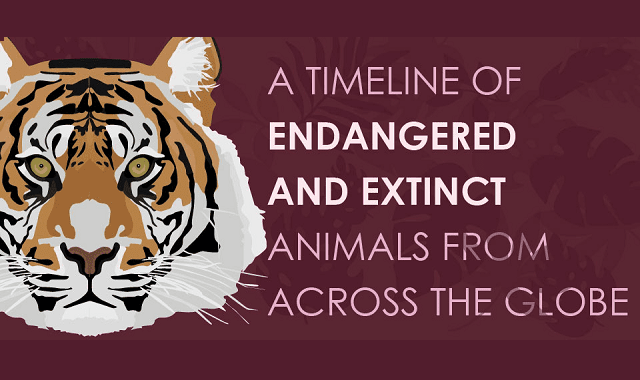 Extinct and Critically Endangered Animals from Around the World #Infographic ~ Visualistan '+g+"
Extinction of a species is a tragic thing, but it’s also a natural phenomenon. One of the most famous mass extinctions is the Permian mass extinction, while we’re not entirely sure why it happened, several causes have been proposed for the event: asteroid impact, flood basalt eruptions, catastrophic methane release, a drop in oxygen levels, sea level fluctuations or some combination of these, but all of these causes are of natural origin. However, we’re currently in the middle of another mass extinction which has almost entirely been caused by us — humans. In fact, 99 percent of currently threatened species are at risk from human activities, primarily those driving habitat loss, introduction of exotic species, and global warming.